The Gazprom Football for Friendship (F4F) is the International Children’s Social programme implemented by Gazprom company – official partner of FIFA and the World Cup Russia 2018. The goal of the programme is to involve the young generation throughout the world in promoting the most important human values among their peers – friendship, equality, peace and respect for different cultures and nationalities. 211 countries and regions joined the Football for Friendship in 2018. 32 International Friendship Teams were formed during the Open Draw, as well as playing roles for each young football player from each country (goalkeeper, defender, midfielder or striker) were determined. The teams were organized using the “Football for Friendship” principle – athletes of different nationalities, different genders and different physical abilities the age of 12 played in one team. Each international team was trained by young coaches – football players from 14 to16 years of age from different countries. More than 5000 media from around the world covered the programme events, as well as the F4F International Children’s Press Centre, consisting of young 12-year-old journalists from 211 countries and regions. 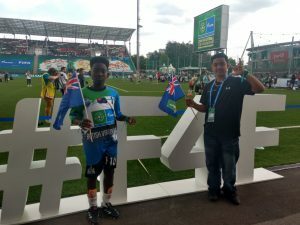 To be part of a global event that became the world’s most attended event in terms of countries, 211 was in itself incredible for the Virgin Islands, but the exposure given to the two young participants, Ryan Ramlall, a 12 years old who represented as a young journalist and Deshawn Richardson, 13 who went as a young football player were both enriching and life changing. The boys participated in a 3 days camp focusing both in journalism and soccer. The culmination saw interviews by Ryan getting published and Deshawn’s team, the Humpback Whales making it to the semi-finals of the F4F championship. Both Ryan and Deshawn represented the BVI well, being held in high regards by their peers. They clearly ensured that our tiny territory was recognised through their passion, intelligence, friendliness and most importantly their conduct. As an ecological initiative of Football for Friendship all the 32 International Friendship Teams were named after endangered animals of all the continents of the world. Young F4F ambassadors from different countries participated in the Open Draw ceremony: Zahar Badjuk (Russia), Runqi Cui (China), Juan Manuel Pinola Silveira (Uruguay), Lilya Matsumoto (Japan), Ananya Kamboj (India), Christopher Sowah Mensah (Ghana). The Chairman of the Board of Directors of PJSC Gazprom Mr. Victor Zubkov, FIFA Secretary General Ms. Fatma Samoura, Russian figure skater and Olympic champion Ms. Adelina Sotnikova, Two-time champion of Russia and European rugby champion in wheelchairs Mr. Yuri Kamenets, the Legend of world football Mr.Marco Van Basten addressed the participants with the words of support for the programme Football for Friendship. “When you dream of something, when you have a goal – you just do everything to achieve it. Of course, it requires dedication and you have to sacrifice a lot on your way. But when the goal is reached – it’s the best thing that can ever happen to you. And that is what happened for me. I think it’s a wonderful projects for kids, as it gives them a chance to experience a grown-up’s life, and reach their goals. I wish all the children the best of luck,” – said Olympic figure skating Champion Adelina Sotnikova.